This book feels like a rediscovered treasure found once again at the back of a dark attic, loved but forgotten. Dusted down and spruced up, it suddenly fits again, makes sense again. You wonder why it was cast aside in the first place, wonder why people stopped loving it. was first published in 1990, and fell out of print many years ago. This reprint feels current, it feels vital and alive, and it shows that Butcher’s book was ahead of its time all those years ago, with its focus on quality and regionalism, with heritage and tradition. Butcher implies early on that defining Spain is a hard task because it’s a country of many variations. It may be easier to think of Spain, at least in culinary terms, as a loosely formed collective, with each region’s food only bearing a passing resemblance to that of its neighbour. Nonetheless, there are similarities, as Butcher argues, a deeper underlying thread running through the food of Spain that make it undeniably Spanish. “Spain stamps its personality, and what a personality it is, ineradicably”. It seems improper not to talk of the recipes. 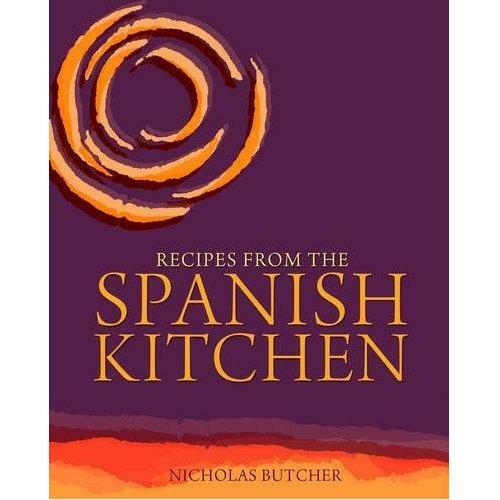 They’re all here, in their earthy Spanish homeliness…the paella, the tapas, the crema Catalana, the tortillas…but the food isn’t the only reason this book is so enticing. Food is one thing, but great writing is another entirely, and Butcher can certainly write, his flowing prose betraying an excitement and affection for his subject. Here is a writer who knows his subject and wants to tell his readers about it in the best way he knows how. It’s a joy to read – insightful, expert, affectionate. Lunch is simple called ‘the meal’, la comida, and is the highlight of the day. It is the time for conversation and tapas, that untranslatable word which means a little plate of something, hardly more than a mouthful, to eat with ice-cold lager, sherry or wine. … Often they will talk about food too, not with pretension but as naturally as we talk about the weather. “As naturally as we talk about the weather”…a parallel that brings with it instant understanding. We talked at work today about the mundane and formulaic conversations we have with people who visit our office as we walk to the meeting room…traffic, weather, holidays…I guess the Spanish do the same, they just talk about jamon. is a great read. It’s absorbing and interesting, with first-class recipes. There may not be a better introduction to the food of Spain than this. I think the way books are written is just as important, if not more so, than the recipes they contain. The recipe books I have enjoyed and learnt from the most and have taken the most information from are not necessarily the ones I have cooked from the most often. I’m always on the look out for books out there that can cater to evening reading as well as to a desperate search on what to make for dinner so thank you for your recommendation.